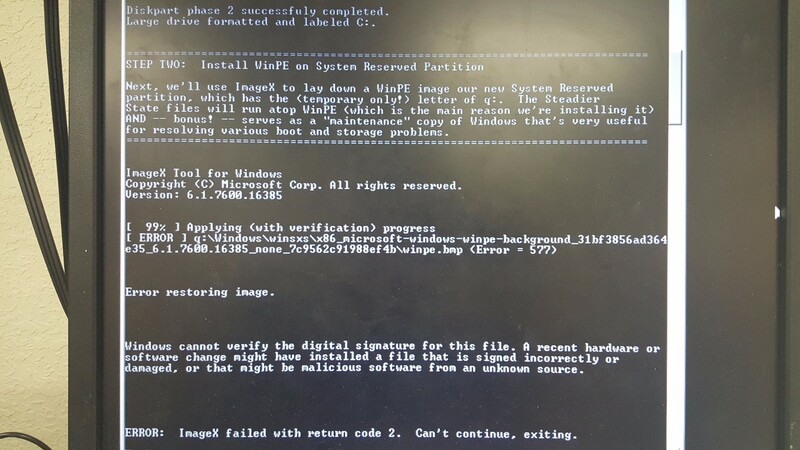 I am currently trying to set up a PC with Steadier State installed and I seem to have hit a bump in the road. Everything seemed to be working properly until I ran the "prepnewpc" command. I received an error at 99% and I can't proceed. Here's the error message that I'm receiving. I am encountering this exact same error on the exact same file. 1) The most common problem is that it's really, really important to follow the directions EXACTLY. Really, this is the case -- a second hard disk on the machine you're trying to make the image of will blow things up considerably. 2) That includes the ADK pieces. Get the latest version. Although honestly I've not tried this recently so perhaps something in ADK has changed to blow up imagex. 4) There are logs, recall -- there may be a clue there. This is an interesting theory, but I don't think that's it. I modified the buildpe.cmd to no longer copy winpe.bmp or winpe1.bmp and the error went away. Of course, now there's a new, unrelated issue having to do with the system for some reason making the boot flash drive drive 0 and ignoring the internal hard drive. Edit: scratch that. I had to recreate the flash drive because the failed prepnewpc process had dropped some boot info on the flash drive and that was causing issues. So basically, get rid of the background images and everything works. Could you please walk me through how I should modify the buildpe.cmd? Thank you for figuring out the solution, I really appreciate it! Am encountering this, have modified buildpe.cmd to REM the lines for copying winpe.bmp and winpe1.bmp but it isn't passing it; continues to come to a stop at same place with same error. Any advice or direction on how exactly to pass this?